Merry belated Christmas, my friends. And here’s a little present, at least for my crafty friends. 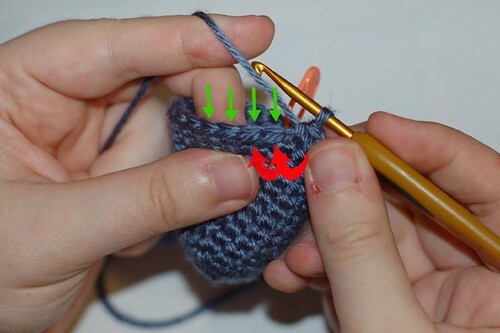 Since I couldn’t find a drawing or photo online of how to do an invisible decrease (invdec), I decided I might as well put one up myself — it’s not always the right one to use, but it’s such a lovely, useful stitch, especially for amigurumi. Here’s a slide show of it (probably overkill on some of the steps; with all this folderol you’ll think it’s a hard stitch, but it really isn’t, though sometimes it’s a little tight to fit the hook into. Oh well). For those who for some reason can’t see the slide show, here’s a few of the more relevant photos. The green arrows just show the sideways “v”s of the top of the stitches. The red arrows point out the front loops where you’ll insert the hook. Up through the front loop of the first stitch. … and you have three loops on the hook. 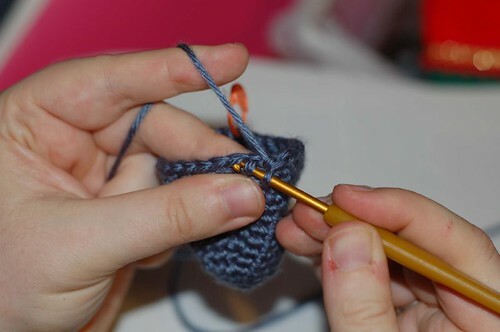 Yarn over and draw up a loop through the two front loops, then finish as you would a regular single crochet. This is a view of the wrong side of the crochet. The red arrow points to the back of the invisible decrease (see how there’s a dropped line of yarn, just below where the arrow is pointing? 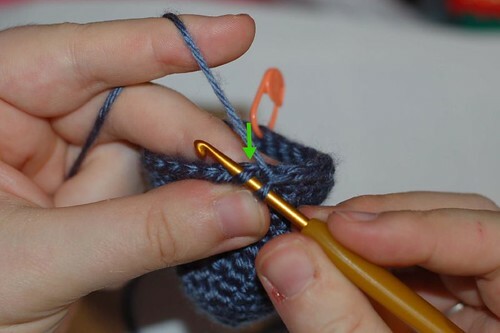 that’s the two back loops from the two stitches you decreased to one), while the green arrow points to the back of the single crochet, for contrast. All this because from the front (which I probably should’ve also taken a shot of, oh well, go try it and see how awesome it looks) it’s well… almost invisible, so if you need to count back to the decrease you may have to look at the back of the work to tell. And this is what you’re looking for. 37 Responses to "Invisible Decrease Tutorial (invdec)"
I am totally incompetent in any craft and/or tactile project. 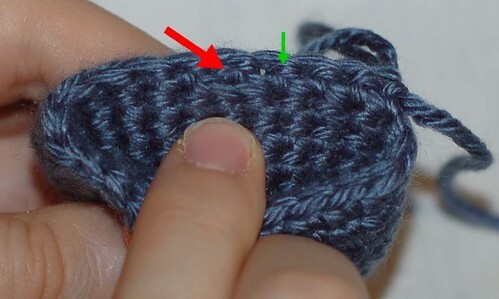 Fantastically clear.. Just one question – if you are doing amigurumi and using invdec, do you stagger where you postion the invdec stitch? 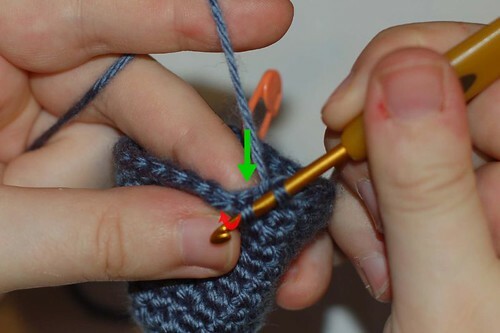 That is, if you are crocheting an arm/leg and have to do 3 rounds where you drop one stitch in each round (using and invdec) do you do the first invdec on stitch 1, then on the next round, do it halfway round the round, and on the third round, do it at the end of the round? I’ve just done it with an invdec at the beginning of each of the three rounds and it leaves an ugly angled decrease, hence my question…..please help! I’m curious, if that’s an invisible decrease, what’s the visible decrease like? Thank you so much for taking the time to post this tutorial. I wish I’d found it months ago! Thanks for your great tutorial. I used your pics and displayed them on my blog (I need to use Chinese to explain the steps) I did put links and link back your pics back to your flickr. I hope you don’t mind. Thanks again for your pics. Thanks for this tutorial! 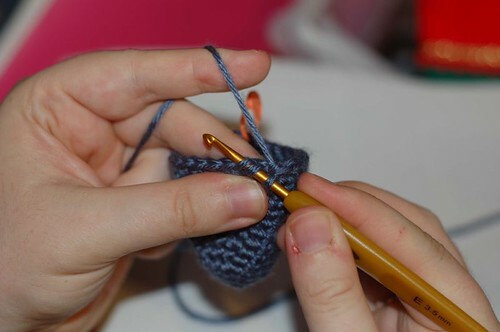 It’s going to make a lot of difference in several of my crochet projects (not just amigurumi). AWESOME! I’ve tried both and THIS is way better in the over all finished quality of my crochet works! Thanks for such a great tut! saw a video tutorial, but it was too fast and they didn’t repeat it. thanks for the photos. why isn’t my address “behind girls college”? thanks! i was very unhappy with my old decreases, this looks so much better! p.s. I am VERY new to this!! Im defo gonna try this out ! I hate those gaps from decreasing so hope this will work better 😀 TY ! This is how I’ve always done it, what is the other way?! Good to know I’m doing something that looks nice 🙂 Do you normally just skip a stitch when decreasing? you forr supplying this information.